Unless you were a devoted history major in school, you might be a bit surprised to discover that France once ran parts of India. The British were the most famous, and many people realize that Goa was one of the few Portuguese territories, but France was there too, and Pondicherry is their most lasting relic from that era. The name was officially changed to Puducherry a few years ago, but nearly all the signs and websites and everything else still call it Pondicherry, except for resident slang which shortens it to ‘Pondy.’ Located a couple hundred kilometers south of Chennai on the eastern coast, Pondicherry is quite remote, which is probably the primary reason why it retains so much of its colonial charm and a low-key lifestyle to this day. Anyone who has visited any of India’s huge cities – the ones with populations well over one million – can tell you how insanely chaotic they feel every moment you are outside. 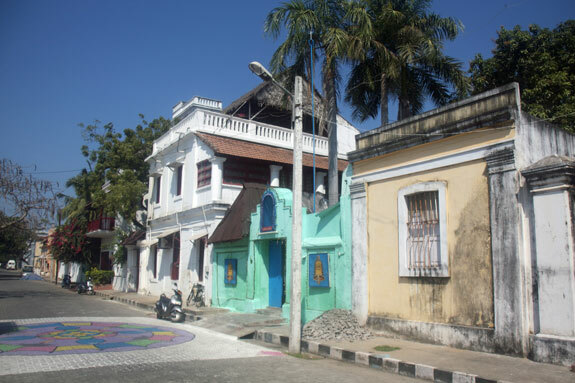 Some of the smaller towns are so dense and compact that they feel that was as well, but Pondicherry absolutely does not, at least not in the expat and tourist districts along the coast. THere is, in fact, a very crowded city that has developed starting about 8 or 10 blocks inland, and gets even more crowded the further inland you go, so it’s remarkable that the coastal area is still quite peaceful and is filled with French architecture and other influences. You can’t discuss Pondicherry for long without mentioning that part of the town is dominated by the Sri Aurobindo Ashram, which is an incredibly popular meditation resort that also runs quite a few lovely guesthouses nearby. It’s true that the city does attract a great number of new-age Westerners, and there’s all the more reason to visit if that describes you, but there are also plenty of expats, many of whom are French, plus budget travelers and others just touring India. Those who are just spending holiday time in India can easily get worn out on the limited Western food options, or their digestive systems can no longer handle nonstop masala at every meal, so Pondicherry is a wonderful break from that. There are quite a few places that specialize in baguette sandwiches that are cheap, delicious, and made on freshly-baked bread that is hard to find anywhere else in India. The beach itself consists of huge boulders leading out into the ocean, but there are large patches of sand above where sunbathing is possible. Interestingly, as is true for nearly all of southern Asia, the locals love to use the beach before dawn and after sunset, while they rarely go near it when the sun is out. 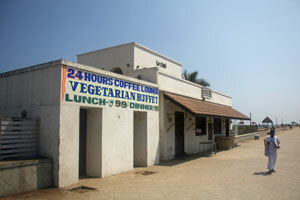 One restaurant in particular called Le Cafe sits on the beach side of the main (and quiet) road, offering a vegetarian buffet daily for 99 rupees (about US$2), and it’s surprisingly good. There are a few 4-star international standard hotels in Pondicherry, but most accommodation consists of simple guesthouses, many of which remain from colonial times. It’s a welcome break from the usual Indian places if you’ve been traveling for a while, and prices for nice air-conditioned rooms start at around US$15 per night. It’s not actually worth it to be right on or near the beach, since most of the restaurants and shops are about 4 blocks away. Eating in Pondicherry is a pleasure, as stated above, partly because meals even at French-inspired restaurants start at around US$2, with nearly any main course costing under US$5. Fans of beef will be happy to know that in addition to being on the main streets, cows are on the menus of a number of places here, at very reasonable prices. If you are staying in a fancy hotel and you eat in their restaurant you’ll be paying more, but the quality elsewhere is quite good so there’s really no reason to. Another big plus for Pondicherry is that it’s mostly a tax-free zone, due to the fact that it’s Union Territory (as opposed to one of India’s states). This means that general shopping is cheap, even for India, and that alcohol is cheap and available as well. Expect to pay around 90 rupees (US$2) for a large bottle of Kingfisher or other local brands. Some restaurants don’t have alcohol on their menus (liquor licenses in India are fairly expensive and hard to get) so the trick is to just ask and chances are they’ll happily serve you anyway.